The Metal bellows coupling is equipped with a hub that is made from aluminum and bellows made from stainless steel. 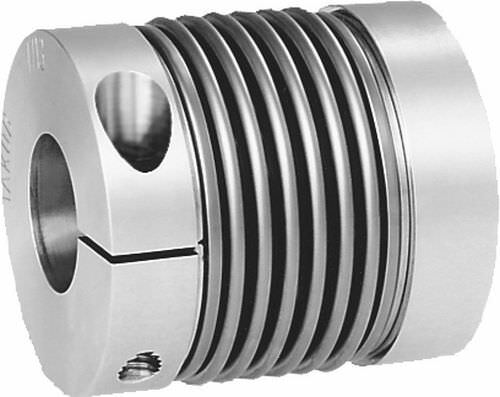 This coupling requires short assembly time and an easy installation due to the presence of its radial clamping hub. If there is a limited installation, the necessary tightening torque of the clamping screw must be utilized. This product’s seat shaft or hub is considered to be a transitional seat. Its admissible seat clearance shaft/hub measures a min. of 0.01 mm and a max. of 0.04 mm. Moreover, this coupling contains boreholes that are smaller, thus making the optimal transfer of the nominal torque not assured. Lastly, as the bellows are consist of thin stainless steel sheets, disassembly is necessary.